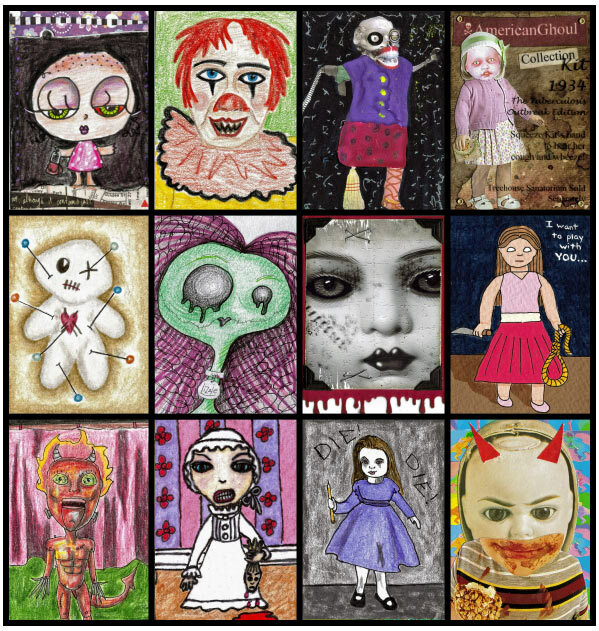 ATCsforAll.com: Dark and Deadly Dolls! Dark and Deadly Dolls Swap! From the swap: "I was cleaning out my closet this weekend, and found a box I had forgot about. Inside was an old Living Dead Doll of mine. My boyfriend had complained that he couldn’t stand her staring at her and she creeped him out (I couldn’t disagree, especially at night!) so we packed her up to feel safer! Neither of us wanted to hear unidentified noises at night and think it was the pitter patter of tiny doll feet This swap is all about creepy dolls. Create your own Living Dead Doll, ventriloquist dummy, or broken and abandoned doll. Check out the haunted doll auctions on ebay for inspiration. Make ‘em dark and deadly, the scarier or haunting the better! "